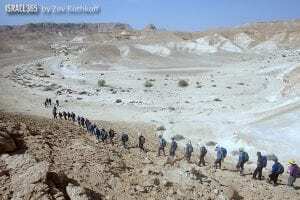 A group of hikers in the southern region of Israel. Until now, Hashem has said that the ten plagues are meant to teach the Egyptians that He is the true God. At this point, He adds another dimension: The plagues are also intended to cause the Children of Israel to recognize God. Sometimes, even people of faith need a spiritual boost. After living in Egypt for generations, the Jewish people have been influenced by their idolatrous surroundings. The plagues serve to remind them that Hashem runs the world, as they demonstrate God’s control over everything: Water, earth, the animal kingdom, health, flying insects, light and human life. This lesson is especially important as the Children of Israel are about to follow God into the wilderness on their journey to the Promised Land. Jews are commanded to remember the exodus every day of their lives. The memory of the miracles that took place then, helps strengthen our faith and ability to meet life’s constant challenges. I started my journey over fifty years ago and uh yhvh has lead all the way and I have many experiences and testings and trials but He has been faithful and I have the promise of my final destination “Heaven”. I am now 71 years ago and looking for the blessed hope.